It has been a long time since my last post. I am vacationing with my son here in the “buckeye state”. 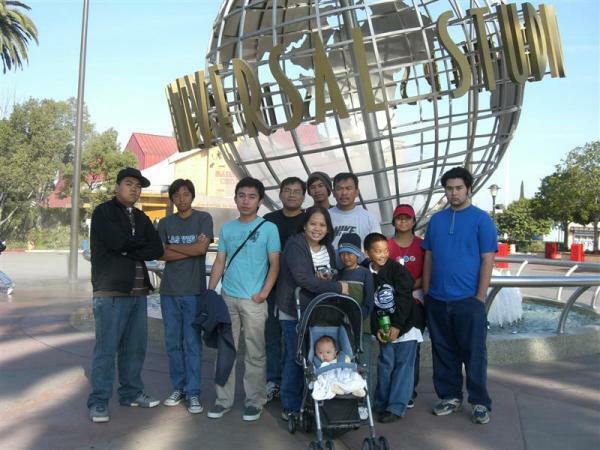 We flew from Seoul at the end of October to the “golden state” where my brothers reside and spent 10 days there. We had a great time visiting some of the state’s famous amusement parks with my brothers and their families. After those 10 busy days, we flew north to where my mom and sister are residing. When we left Korea, my son was 5 months old and I was very apprehensive about flying alone with him on the plane. I first booked a flight with an american carrier but after all the negative comments I read on the net, I finalized my trip with Korean Air. It was such a blessing since the flight attendants with KAL were really helpful on that 12 hour flight. The FAs and a few of the passengers took turns taking care of my son, thus affording me some time to eat my meals and go to the restrooms. I would not have survived that flight if not for them! This is my first trip to the land of milk and honey. The prices here are much lower compared to that of Korea’s. Food and gas are cheap! No wonder why so many Americans are big. Even if there are lots of food here, I kinda miss Korean food. I find the food, in most of the restos I’ve been to, here bland. I guess it’s because I’ve been used to the tastier and spicier dishes of the land of the morning calm. I like how people here live in real houses and not in rectangular boxes called apartments. I really miss living in a spacious house, that doesn’t look like any other house in the neighborhood, with a backyard and a garage. I like shopping here. Clothes and shoes here actually fit me and there are so many bargain places. But, I really hate that the sales tax is not included in the price tag. As much as there are so many good things here, I miss the dynamism of Seoul. I miss the clean public bathrooms, free drinking water and the efficient transportation system of my city. Here, I have to shell out almost $2 for a bottle of water and you can’t go anywhere without a car! You’re the first ever who says she misses Seoul’s clean public bathrooms. Quite surprised since most of Western expats always complain how dirty public bathrooms are in Korea, while theirs is sparkling clean. hi! didn’t know you have baby boy till I ready your comment on mine. congratulations! I always say to new moms to savor every moment of with your babies, kasi they grow so fast talaga. just yesterday my little one was this tiny pea in the pod and stays wherever I put her, now she’s an explorer and a kicker – wont even let me hold her when she’s busy with something. hayyy.